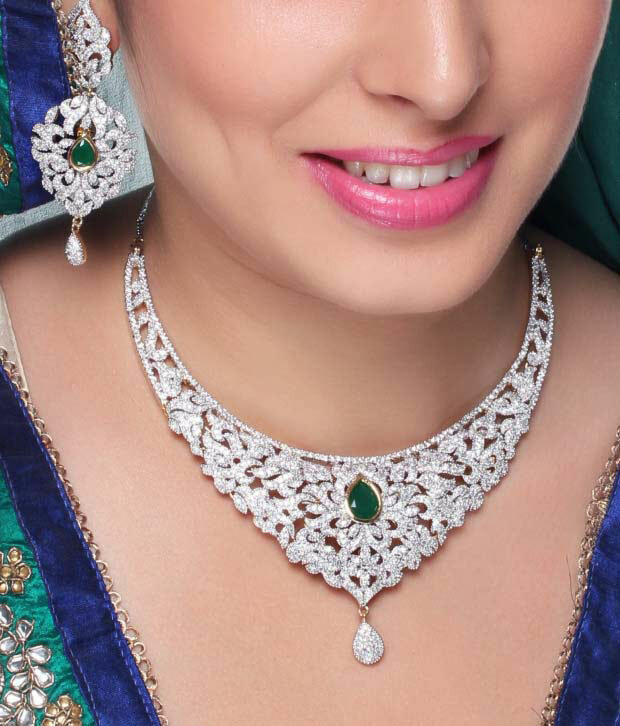 Solah shringar refers to the sixteen adornments of a Bride (Woman) for beautification. 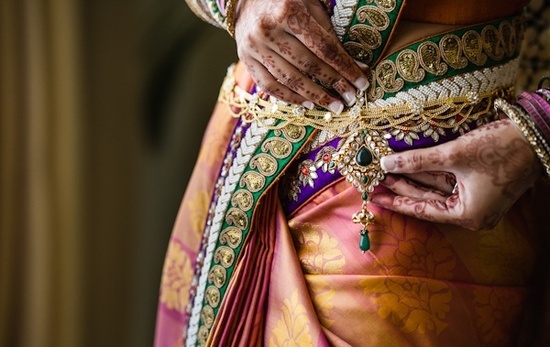 Solah Shringar is especially important for an Indian bride on the most significant day of her life. 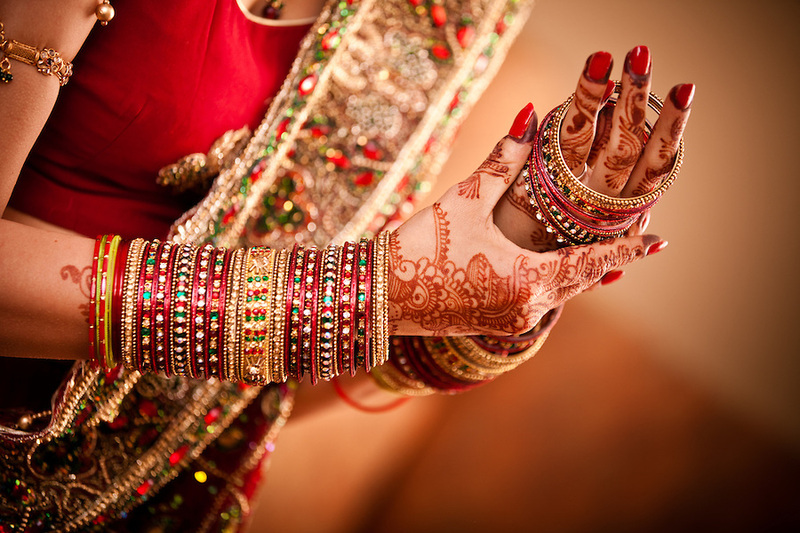 In India, the beautification of the bride consists of sixteen parts and covers almost every part of the body right from the head to the toe. These solah shringar enhance the beauty of the bride from head to toe, embellishing each part of part of body stunningly. 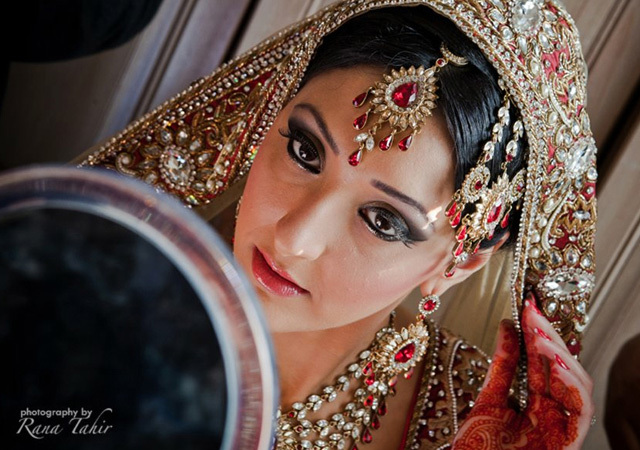 Thus, all the brides go through this complete makeover for that special day. So, for all the girls waiting to be brides, here is a quick look at the elating procedure of solah shringar. 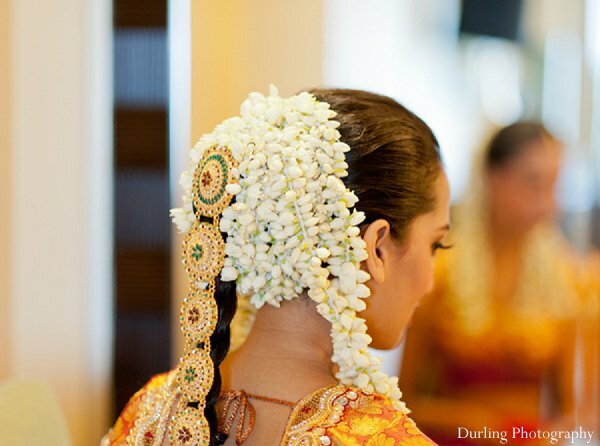 A hair accessory called Maangtika is worn on the central parting of the hair of the bride mostly made out of gold and embellished with semi precious stones, pearls or diamonds. Side mang tika is also called as Jumar, It looks pretty but out of fashion of now! 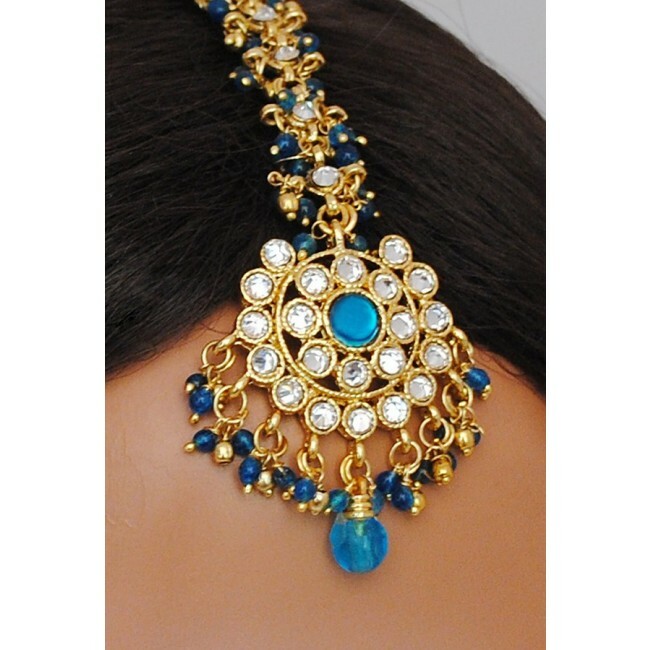 It ‘s a hair ornament which goes along the hairline, that can consist of one or several chains along with a tikka. 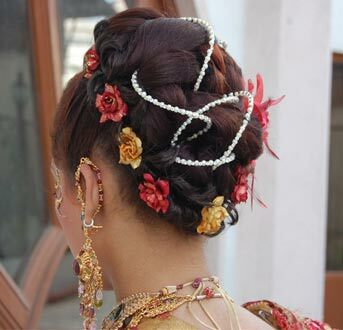 After styling the bride’s hair one can decorate the hairs with flowers & imitation jewellery designed for hair which also called as hair ornaments. It has a strong religious implication and is a sacred symbol of a married woman is put on the bride’s forehead and decorated with red and white dots around it and along the eyebrows. 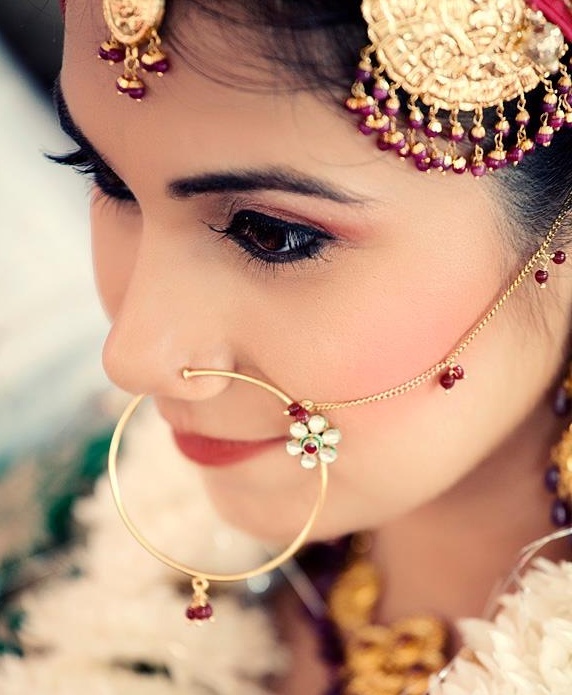 The Bride is made to wear the Nose Ring making her look traditional and ethnic. This ring is made of gold with pearls or other precious gems and is worn on the left nostril and is supported by a gold chain, which extends just behind left ear. Nose rings can be little studs, small rings or even large hoops. Most of the Indian nose wear is in titanium, silver, gold and stainless steel. 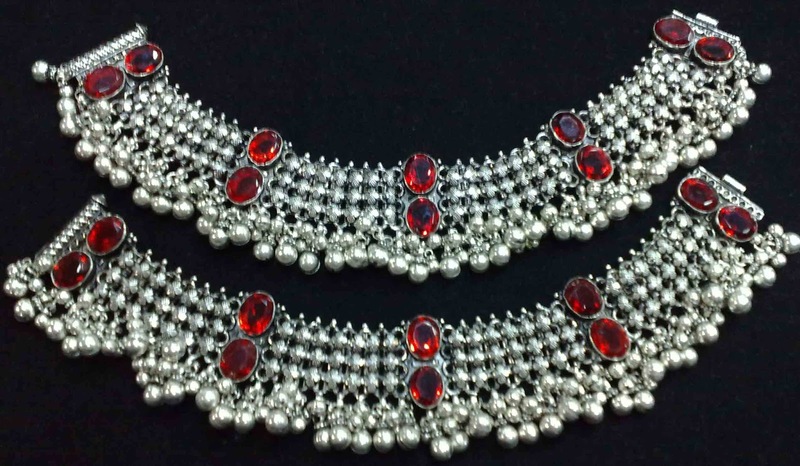 The best part is they have a variety colors or stones embedded in them to enhance the look and the overall beauty. Ear rings adorn the ears of the bride. Since the ear rings worn by bride are quite heavy they are normally supported by a gold chain passing over the crown of the head. 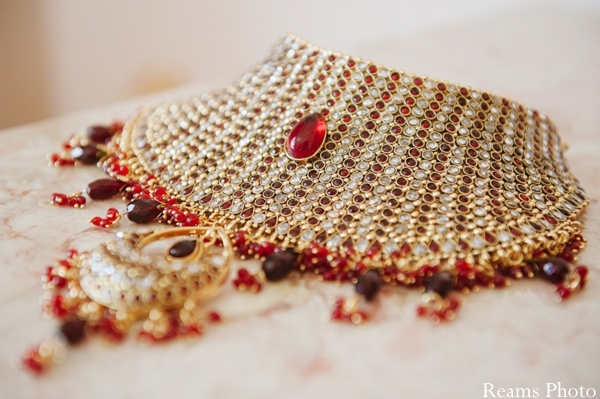 Necklaces and chains of different lengths which is usually made of gold and embellished with diamonds, pearls or other precious stones are also worn by the bride. 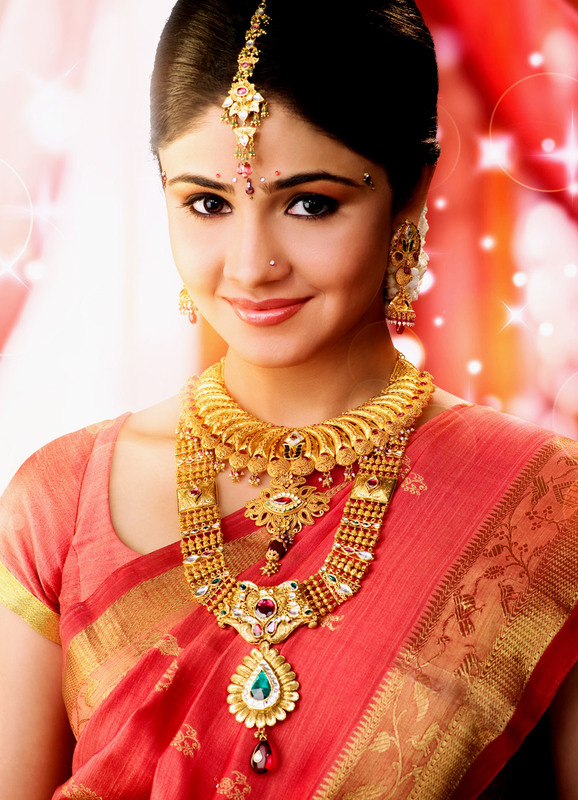 Mangalsutra which is worn around the neck is tied by the groom during the wedding rituals. 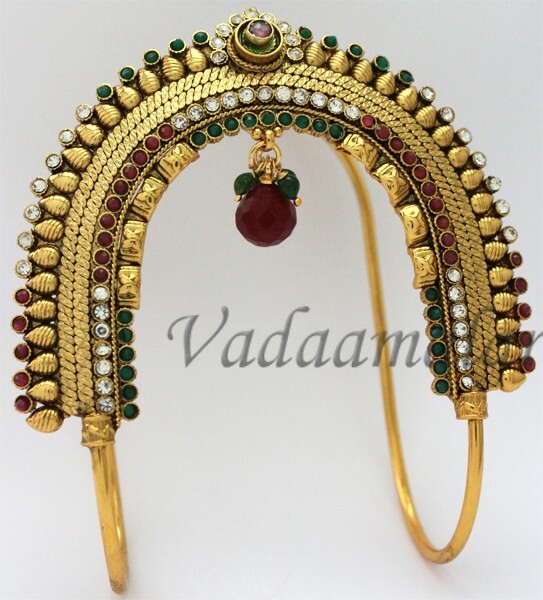 Baajuband or armlets are worn on the upper arms of the bride over the sari blouse. 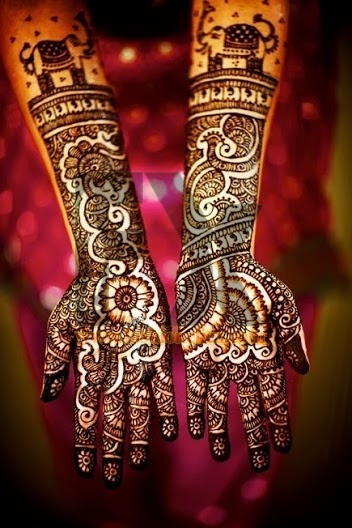 In India marriage is a very important celebrations, to make the wedding more colorful applying mehendi art on hand is a custom. The wedding ceremony is incomplete without mehendi function. 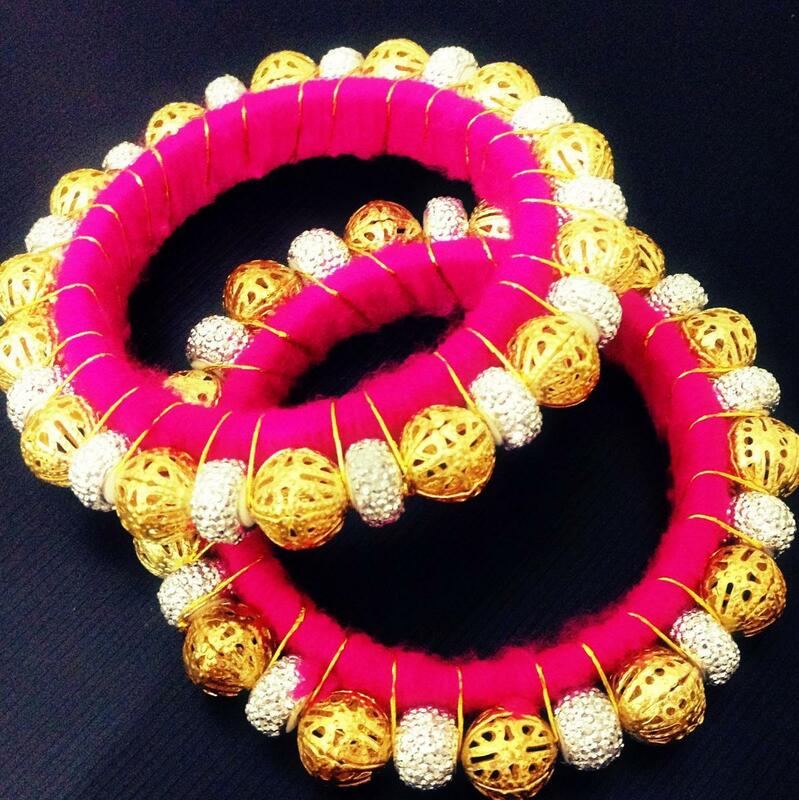 Bangles are part of traditional Indian jewellery. 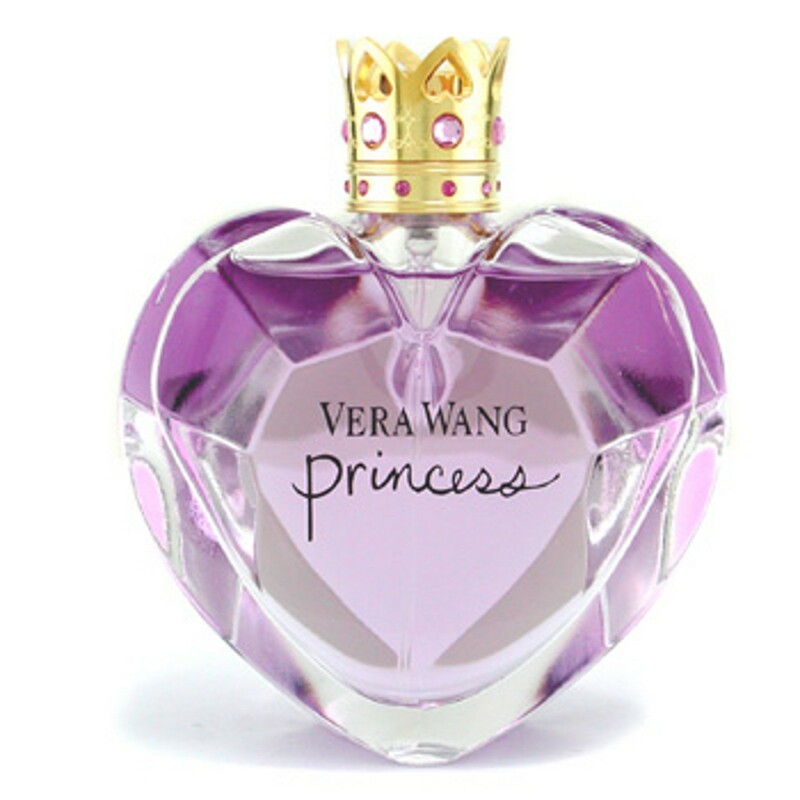 They are usually worn in pairs by women, one or more on each arm. 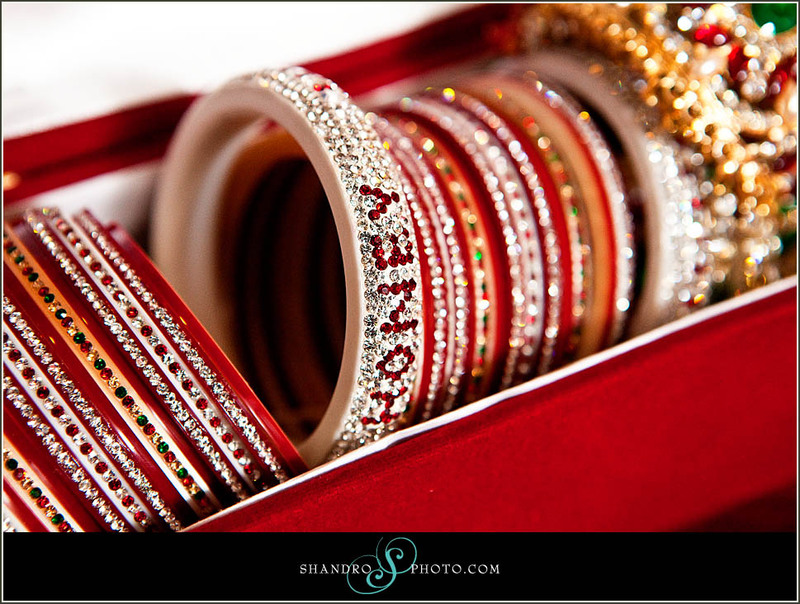 Most Indian women prefer wearing either gold or glass bangles or combination of both. 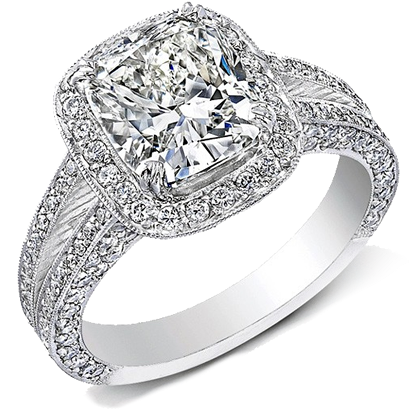 The fourth digit or ring finger of the left hand has become the customary place to wear a wedding ring in much of the world, though in certain countries the right hand finger is used, but bride can wear eight rings in both her hands, which are attached with a central flower or medallion that covers the upper part of the hand called hathphulor. Kamarband is a beautifully designed gold or silver belt is worn around the waist of the bride studded mostly with beautiful gems. The belt not just enhances the waist area but also helps in holding the Sari or Dress in place. An anklet, also called ankle chain or ankle bracelet, is an ornament worn around the ankle. Barefoot anklets historically have been worn for centuries by girls and women in India, where it is commonly known as payal. Anklets are an important piece of jewellery in Indian weddings worn along with saris. 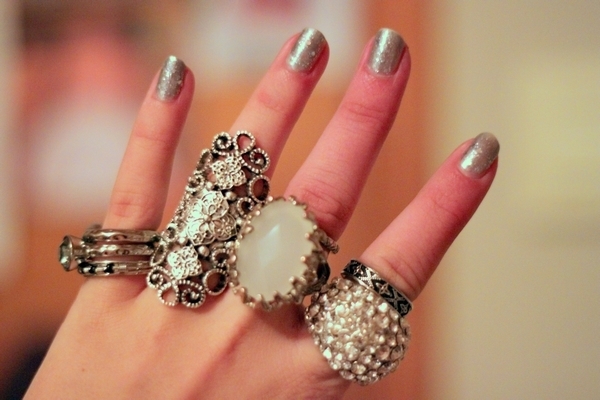 A toe ring is a ring made out of various metals and non-metals worn on any of the toes. The second toe of either foot is where they are worn most commonly. This is because proportionately it's the longest toe and thus the easiest toe to put a ring on and stay without being connected to anything else. 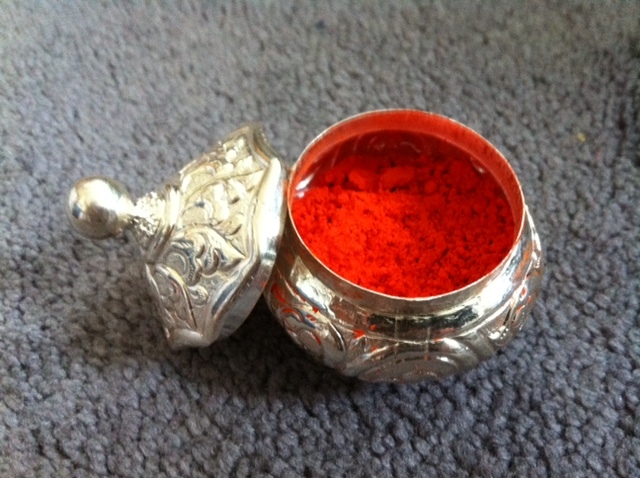 And finally Attar or fragrance is applied on to the bride to keep her fresh and smelling good. All our brides to be get ready to deck yourself up in the sixteen adornments of the Hindu ritual of Solah Shringar.